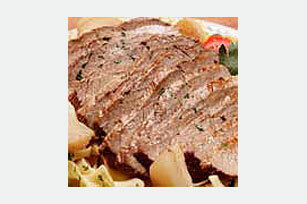 Make this beef chuck steak recipe super tender with onions and A.1. Sauce. Our Braised Beef Chuck Steak Recipe is juicy and ridiculously tasty. Brown meat in hot oil in Dutch oven or large saucepan on medium heat. Remove meat from pan; drain. Add steak sauce and water to pan; bring to boil. Return meat to pan; top with onions. Reduce heat to medium-low; simmer 1 hour 30 minutes, basting occasionally and adding additional water, if needed. Slice meat. Serve over hot cooked parslied noodles, if desired. Prepare as directed, using a beef brisket.